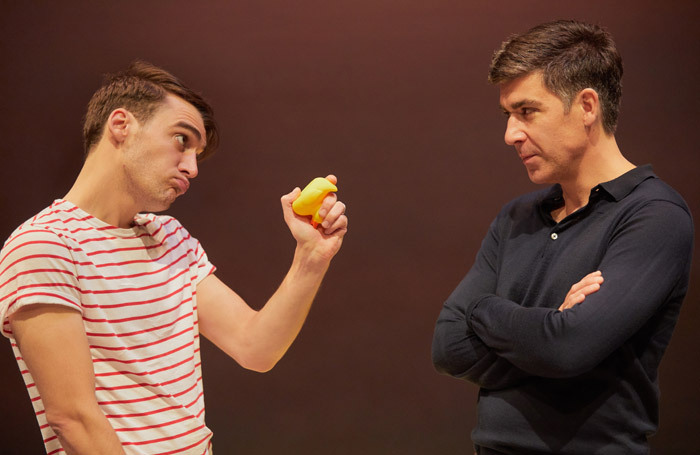 Chris Thompson’s Of Kith and Kin starts off as comedy about a gay couple, Daniel and Oliver, who are on the cusp of parenthood. Their best friend has agreed to act as their surrogate and they’re enjoying the baby shower. Then Daniel’s mother shows up and suddenly the play morphs into something altogether darker and altogether more compelling. Thompson’s play moves through three, very different, acts. The breezy humour of the first is soon consumed by the courtroom drama of the second, before ending with a mediation on how toxic upbringings, secrets and lies can corrode a relationship. It’s not without its flaws as a piece of writing, but the strong performances and Thompson’s biting dialogue make it consistently compelling. Robert Hastie is a director who gets the most out of his actors and in James Lance and Joshua Silver, he has a magnetic leading pair. Lance is initially a laid-back, if anxious, father-to be, but soon unravels into something a lot more complex. Silver has the less flashy role, but his tightly wound nervous energy means it’s hard to take your eyes off him. These emotionally broken, even dislikeable, characters probably aren’t people you’d wish to spend any time with, but their neuroses and insecurities are fascinating to watch. James Perkins’ set transforms the intimate space of the Crucible Studio into a suburban living room, a family law courtroom and finally, a baby’s nursery, as strewn with wreckage as the couple’s relationship.